Roderick Strong might have eaten the pin here, but trust NXT’s Creative team to still elevate the slumping Messiah of the Back Breaker. By keeping him involved with the Undisputed ERA, Strong remains firmly at the top of the card. 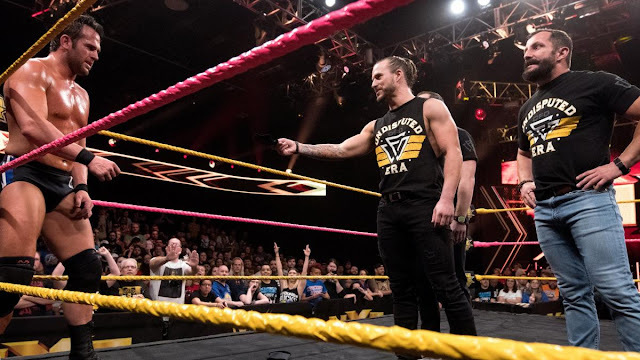 It makes sense for Adam Cole, Bobby Fish, and Kyle O’Reilly to recruit Strong; between their history in the independent scene and Strong’s desire to win, Cole’s sales pitch to Strong rang true to a certain extent. The Undisputed ERA can help Strong win. And this “will he or won’t he join” angle is a great way to keep Strong relevant outside of the title picture. Even if you’ve been spoiled by taping results, you’d still want to watch how this angle plays out in the coming weeks. Tino Sabbatelli and Riddick Moss def. Oney Lorcan and Danny Burch: This was a pretty OK match, but Nigel McGuinness and Mauro Ranallo did a great job at expanding the story in the ring. They highlighted Lorcan and Burch’s relative inexperience as a team, and it made sense for them to lose to a duo that’s been working the tag team scene for about a year now. Good commentating shouldn’t just tell you what’s happening in the ring, it should complement the viewing experience. Move past Ranallo’s excessive hip-hop references and McGuinness’s hit-or-miss dry wit, and you get two people in the booth capable of accentuating the action with solid insights. The less said about Percy Watson, though, the better. Nikki Cross won the Battle Royal to get the final spot at the Fatal-4-Way match for the NXT Women’s Championship at TakeOver: WarGames: Battle Royals are a mess, and this one was no exception. It did have some great storytelling moments though. Nikki Cross kicking things off by eliminating Taynara Conti was a great way to address their beef, and with Conti getting some measure of revenge by slamming Cross onto the steel steps, it means this short feud isn’t over yet. Aside from eventual winner Nikki Cross going on a roll and eliminating about half the competitors, the biggest stand out was Bianca Belair. People must be really high on her because she had some great moments in this match. She had some of the best eliminations and tried to murder Billie Kay with her hair. Even if she lost, this was a great outing for the -Est of NXT. Velveteen Dream attacked Aleister Black: Good lord, this storyline is awesome. The slow burn escalation is perfect at creating the necessary tension between Dream and Black. And to think both men have only touched one another twice in the weeks this feud had been going on. I’m running out of good things to say about this angle, so I just hope that their eventual match doesn’t disappoint. Top to bottom, this was a great hour of wrestling. Burch and Lorcan are a promising tag team, and even in defeat, they showed us a glimpse of what to expect from the hard-hitting duo. The Battle Royal was a fun mess, and it made a star out of Bianca Belair. Velveteen Dream and Aleister Black’s feud is coming to a crescendo as they’ve finally come to blows. And we got another great main event from Andrade Almas and Roderick Strong, with both men moving their respective angles forward perfectly after the match. WIth TakeOver less than a month away, NXT is doing a great job at building up the card. This episode gets an A.